This is obviously incomplete and is rather St. Petersburg-centric because that’s the material I had to work with. Suggestions for additions or corrections are welcome. First Publix store opens fifty miles east of Tampa in Winter Haven. Table Supply, forerunner of Kwik Chek and Winn-Dixie, acquires Lively Stores, bringing the Miami chain to the Tampa area. First Publix supermarket, Winter Haven FL. Photo by author. 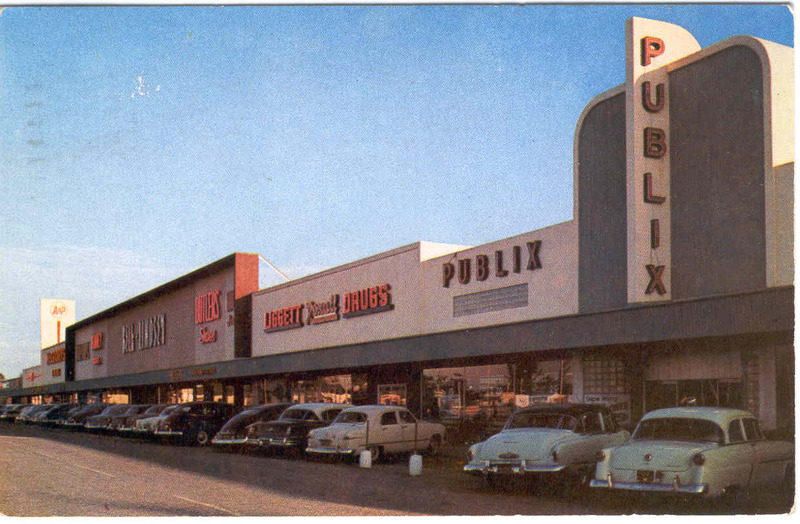 First Publix “super market”, the prototype for the chain’s 1940s and early 1950s expansion opens in Winter Haven. Publix acquires All-American Stores, bringing the chain into the Tampa Bay area. First Big Barn opens in Plant City, operated by the Grco family. This is the precursor to the Kash n’ Karry chain. 14 June: The first Publix in St. Petersburg opens at 1720 16th St N. The store, built in the classic streamline style used by the chain in the 1940s and 1950s features a marble and glass” dirt proof facade, a large parking lot, interior walls of etched wood in “coral, pink, sunshine yellow, dawn grey, and light green”, a white ceiling and green asphalt tile floor, dark green molding and trimming, and backlit neon signs inside. When the store closes in 1982, it will be the oldest continually operating location in the chain. Central Plaza, St. Petersburg. Postcard view. A&P, Central Plaza, St. Petersburg. Courtesy Tampa-Hillsborough County Public Library System. Central Plaza opens in St. Petersburg. It is reputed to be the first large shopping center in Florida and will eventually contain two supermarkets (Publix and A&P) and two department stores (Belk and J.C Penney). Its later decline will be as much a symbol of changing retail trends as its opening was. A&P becomes one of the first tenants in St. Petersburg’s Central Plaza. The 13,500 square foot store features a yellow and green tlle facade, new color borders close to the celiing (soft lavender at front, light green on right, delicate blue on left, yellow at rear), and is entirely self-service except for coffee or special meat requests. Checkouts are located at both the front and rear exits. Dale Mabry Shopping Center in the 1300 block of South Dale Mabry opens, with Publix as an anchor. The Gulf Super Markets chain begins selling stock through newspaper ads. August 16: Britton Plaza opens in South Tampa, with Publix and Belk-Lindsay as anchors. A large, modern Gulf Super Market opens at 1701 North Dale Mabry in Tampa. In two years, it is demolished and relocated on the same plot to accommodate a new Montgomery Ward store. About five other Gulf stores are also in operation. 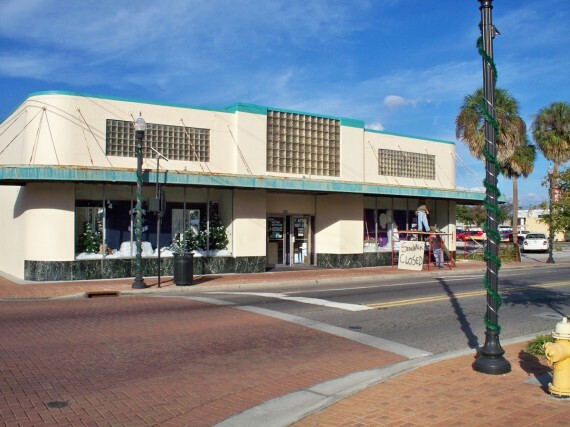 24 January: First area Food Fair location opens at 1685 Gulf to Bay Blvd in Clearwater. 27 March: Second area Food Fair opens at 2900 34th St. N, St Pete. At 45,000 square feet, it is the largest store in the chain. 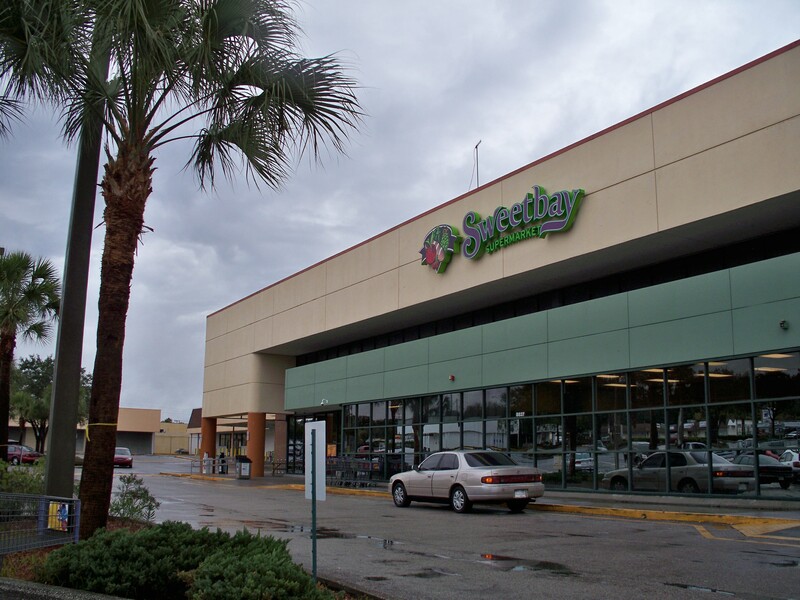 1 June: Third area Food Fair, another 45,000 square foot store, opens at 4119 Gandy Blvd. in Tampa. Kwik Chek, Temple Terrace. Courtesy Tampa-Hillsborough County Public Library System. January: Tyrone Gardens Shopping Center opens in St. Petersburg. 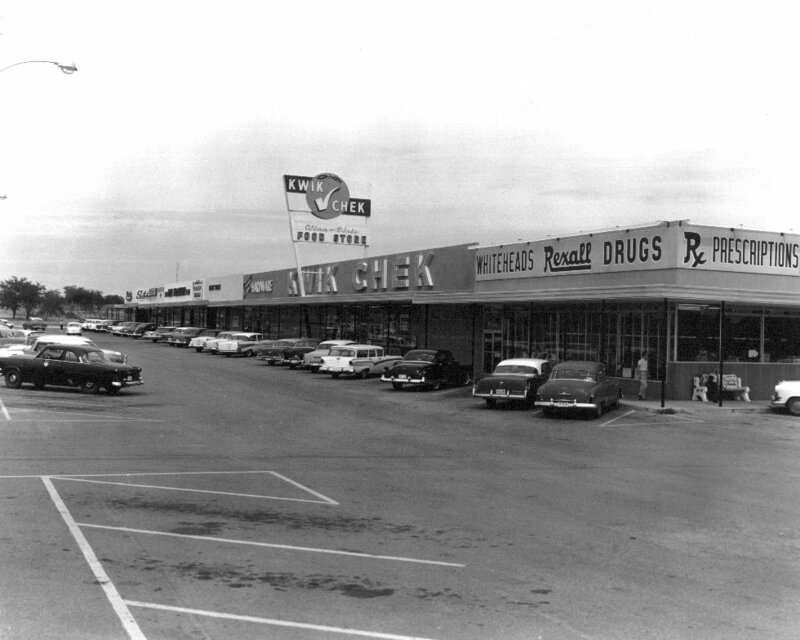 In 1964, this center will apparently have two Winn-Dixie locations. 30 January: Crossroads Shopping Center opens at Tyrone Boulevard and 22nd Avenue in Tampa. Its anchors include Food Fair and J.C. Penney. 16 February: North Gate Shopping Center opens on Florida Avenue in Tampa, with Publix, J.C. Penney, and Maas Bros. as anchors. 23 October: Temple Terrace Shopping Center opens with Kwik Chek as an anchor. 9 February: The Tampa Bay area’s first Grand Union opens at Cortez Plaza in Bradenton. Nine months later, this store is sold to Publix along with all other Florida Grand Union locations outside the Miami area. Food Fair has three locations in St. Petersburg. Winn-Dixie has eleven. Publix has sixteen. A&P has five. 1 March: Hillsboro Plaza opens with Publix as an anchor. May: Grand Union’s first Grandway department stores open in the Tampa Bay area. Wnn-Dixie will eventually lease and operate the grocery departments of these stores. Sun City Discount opens in the Food Fair Shopping Center on 34th St. N. in St . Petersburg. This store would later become a J.M. Fields. The Gulf Super Market on Dale Mabry is now operating as part of seven-store Star Super Markets, which may or may not be the same chain. First Kash n’ Karry stores of the Tampa Wholesale Co. open. Disston Plaza opens in St. Petersburg with Publix, Grant’s, and Woolworth’s as anchors. 14 June: Winn-Dixie opens a revamped Kwik Chek subdivided from the Grandway location at 34th St. N. and 22nd Av. in St. Petersburg. A wall is built between the grocery and general merchandise sections, but an opening remains so that shoppers can move back and forth. Grandway plans to switch to “junior department store operations: with scattered service desks rather than centralized checkouts. 19 February: J .M. Fields opens a 70,000 square foot store in the Food Fair Shopping Center on 34th St. N. in St . Petersburg. Kash n’ Karry partners with Zayre to open new shopping centers. Pantry Pride, St. Petersburg. Newspaper photo. 13 August: The first two Pantry Pride discount stores open in St. Petersburg, both of them converted Food Fair locations: 3131 4th St. N. and 48th St. N. at 54th Av. All Tampa Food Fair stores have already been converted by this time, and two more conversions (2000 Tyrone Blvd. N. and 2400 31st St. S.) are planned for St. Petersburg. Two St Petersburg Winn-Dixie stores will reopen the following week as Save Rite discount food stores (62nd Av. N. at 9th St., and 22nd Av N. at 9th St). Several Tampa stores were also converted recently. Pantry Pride and J.M. Fields stores at Times Square Shopping Center in St. Petersburg are closed. Center is ultimately abandoned and will be demolished ca. 1989-1990. Two Grandway stores in st. Petersburg close. Winn-Dixie is opening new stores in Woolco-anchored shopping centers at Horizon Park (Hillsborough Ave, near Dale Mabry) and Twin Bays (South Dale Mabry). Grand Union announces it will begin building supermarkets on Florida’s west coast, starting in Pinellas County, where St. Petersburg is located. Kash n’ Karry partners with Kare Drugs to open combination stores. 2 May: A Winn-Dixie at 550 16th Av. N. in St. Petersburg closes. The store had opened as a Kwik Chek in 1950. 8 October: The area’s first Skaggs Alberstons combination store opens at 2170 Gulf-to-Bay Blvd. in Clearwater. The 58,000 square foot store is the first of several planned, and as of 2010, is one of the last remaining Albertsons locations in the area. 20 February: The first Tampa Bay area Grand Union (aside from one short-lived store in 1959) opens at 57th Av. W. and 14th St. in Bradenton. This “family store” sells groceries and housewares. The first Jewel T discount store opens at 830 49th Street in St. Petersburg. Another will eventually be located in Central Plaza (in the former A&P?). Kash n’ Karry is reputed to have more then 50% market share among grocers in Hillsborough County, where Tampa is located. California-based Lucky Stores acquires Kash n’ Karry. Former owner Mac Greco commits suicide a few months after the sale. 26 January: Pantry Pride announces mass closings in the Philadelphia, Harrisburg PA, and Tampa Bay areas. The J.M. Fields department store chain is also put up for sale. At the end, Pantry Pride has four stores each in Clearwater, St. Petersburg, and Tampa, plus two in Largo, one in Temple Terrace, and three in Sarasota. 14 March: Jewel T opens a store in a former A&P at Edgewood Plaza in Lakeland. Kroger enters the Florida market with its SupeRx Food and Drug stores. Headquarters for A&P’s Family Mart chain moves to Clearwater. Publix, St. Petersburg. Newspaper photo. 22 October: The winged Lakeview Publix on 34th St. S. in St. Petersburg, open since 1960, closes. 26 November: Grand Union closes its six area stores. 7 November: A&P’s first Family Mart “superstore” appears in Kenneth City At 59,000 square feet, the “futuristic black and white building” with “soft inside lighting and lean, simple fixtures” sports a design based on A&P”s Futurestore prototype. At the time, 17 regular Family Mart combination stores are also operating in Florida. Kroger sells the SupeRx drug chain and rebrands its Florida stores as Florida Choice. 3 March: Kroger buys 17 Family Mart stores from A&P and converts them to Florida Choice. Several Family Mart stores in other states become Kroger stores at about the same time. Kroger sells its Florida Choice stores, thirteen of which are in the Tampa Bay area. Kash n’ Karry acquires several locations, as does Albertsons. Apparently, Kroger had made a bid for Kash n’ Karry just prior to giving up on the market. Lucky Stores sells Kash n’ Karry, which becomes an independent chain again. 12 November: American Stores announces three new “experimental” 78,000 sq. ft. stores to open in the area, two called Jewel Osco and one called Skaggs. Food Lion announces it will enter the Tampa Bay market. A brand new Albertsons replaces a Publix that had closed in 1987 at Britton Plaza in Tampa (and had been one of the original anchors). Ironically, this store will be sold to Publix in 2009 as Alberstons reduces operations in the area. 2 August: First area Jewel Osco store opens in Largo Mall. Sweetbay, former Kash n’ Karry, Temple Terrace. Photo by author. Kash n’ Karry unveils a modern new store prototype. 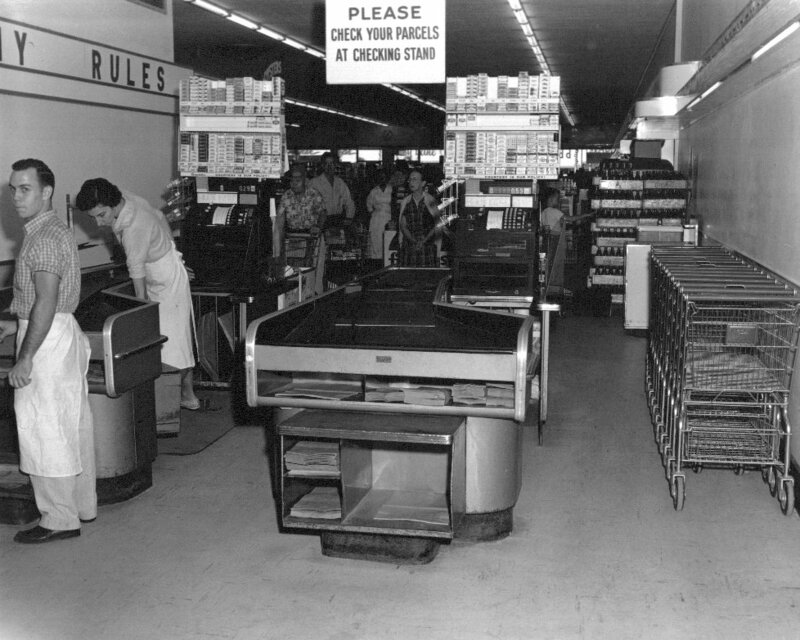 16 March: A new Publix prototype store designed to evoke memories of the older streamline stores, opens on Nebraska Avenue, replacing a store built in 1954. Delahaize/Food Lion acquires Kash n’ Karry. Food Lion rebrands its area stores as Kash n’ Karry. Kash n’ Karry stores begin changing over the the Sweetbay Supermarkets name. The conversion is complete by 2007. Publix purchases 49 of 93 Albertsons stores in Florida and begins converting them to Publix units. As a result, Publix briefly operates stores literally across the street from each other. Sources for this article include, among others, the archives of the St. Petersburg Times and the Tampa Tribune as well as Directory of Shopping Centers, 8th Ed (1964).